Over 240 keywords updated for 2018! 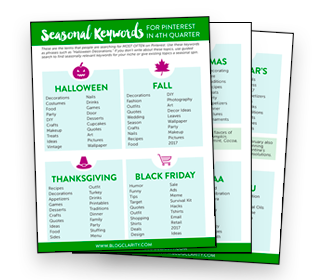 This cheat sheet makes it super simple for you to see what 38 MILLION Pinterest users are searching for during the holiday season. The fourth quarter of the year is when Pinterest sees the most traffic, which in turn can lead to the most traffic for YOUR SITE, too. DON'T MISS OUT ON PINTEREST HOLIDAY TRAFFIC!